Even though it wasn't snow that was dropping from the sky yesterday but torrential rains, I decided to make a batch of these Snowdrop cookies. During these hectic few weeks before the holidays I love to turn to make ahead recipes that can save me a little time when I need it and this is a great one. The dough actually needs to sit overnight. I like it because you can make a batch (or two) the night before, clean up all your mess, and the next day all you have to do it grab the dough out of the fridge and bake it. Only cookie sheets to clean, and if you use parchment like I do, no cookie sheets to clean! 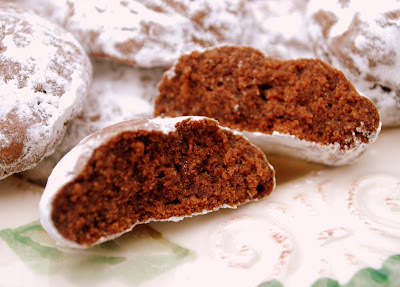 These cookies are dense but moist and have a wonderful chocolate flavor, almost fudge-like. I had a batch waiting for the kids when they got home from school yesterday. This dough will look just like chocolate ice cream when you take it out of the fridge. Don't worry if the creamed mixture looks a little loose before you add the flour. It will all come together after a night in the fridge. In a large mixing bowl cream the butter and brown sugar until light and fluffy. Add the eggs, milk and vanilla. Mix well. Combine the flour, cocoa, baking powder, salt and baking soda and gradually add to the creamed mixture. Cover and refrigerate overnight. Shape in 1-inch balls, place 2 inches apart on an ungreased cookie sheet. Bake at 350 for 7 – 8 minutes or until the tops are crackled. Remove to wire racks to cool completely. 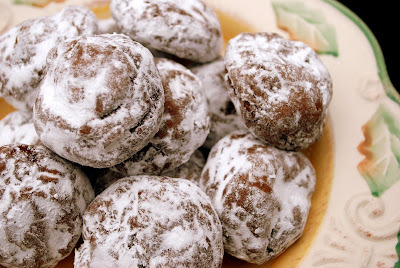 Roll cookies in confectioner’s sugar. They are so cute...my kids would love them too! I love all the cookie recipes! These look good! You gotta love anything that's FUDGY! !